Magnolia Streamside Resort is truly a place for your mind, body and soul. Located in the heart of the Pocono Mountains, and less than two hours away from New York City, it is a perfect place to unwind and escape the hassles of everyday life. Choose from six unique cottages with fully equipped kitchens overlooking a running mountain stream. The Resort boasts numerous amenities including a fishing pond, outdoor swimming pool, fire pits, hammocks and wood burning fireplaces. These newly renovated cottages and suites at Magnolia Streamside Resort offer a true bohemian sophistication, charm and comfort. The Resort purposely eliminated many modern day distractions, such as televisions, in order for guests to connect with Mother Nature, themselves and each other. 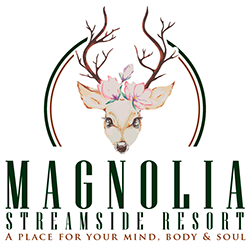 Magnolia Streamside Resort is truly a place for your mind, body and soul!